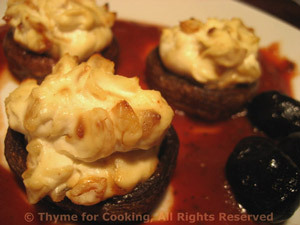 Mushrooms stuffed with Shallots and Chevre, Thyme for Cooking simple starter. Use white button or brown cremini for this. If you want to use the larger portabella you will probably only want to do 2 or 4, depending on size. Roughly chop the shallots and mince garlic. Heat 2 tsp oil in a nonstick skillet over medium-high heat. Add shallots and garlic and sauté until shallots start to brown, about 10 minutes. Put shallots, garlic in a small bowl, add goat cheese and mix well. Add 1 tsp oil and soy sauce to the same skillet. Spoon goat cheese mixture into mushroom caps, dividing evenly. Bake in 375F (180C) oven for 10 minutes, until they are light brown. Heat all ingredients in a small saucepan. Spoon some tomato sauce onto the bottom of 2 small plates. Divide the mushrooms and arrange on sauce. Serve, garnished with olives if you have them.